With only about a year to live (the average age for a wild rabbit) Master Oryctolagus cuniculus, had to make the most of things. So every day, at the crack of dawn he’d leave his underground burrow via a maze of tunnels, to go to school and learn everything he could. Master Oryctolagus (for short) loved history and today was all about the Romans. ‘To eat them of course,’ said the teacher and the little rabbits held their breath. 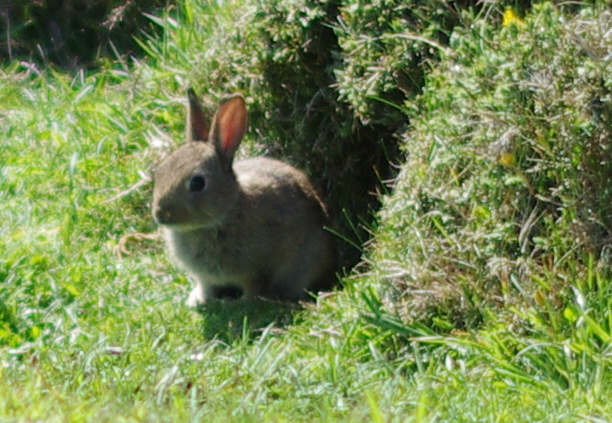 ‘But many years later, the Romans left England and there were no more rabbits.’ The young bunnies breathed again. ‘Then the Normans brought them back to England!’ said Master Oryctolagus grinning. ‘And some of them escaped and took over the country!’ All the rabbits laughed. with the exception of the teacher. The teacher frowned and his nose twitched and he was about to say something when a sudden thump came from just outside the door. Now all rabbits know that this is a sign of danger. ‘We must be silent and hide in the corner,’ said the teacher so Master Oryctolagus and the kits ran and hid themselves. ‘Do you think it’s a fox or a stoat or a buzzard?’ said one wee rabbit. ‘I hope it’s not a man with a gun,’ thought Master Oryctolagus. That was how his mother died and his father too. Without warning, Master Oryctolagus felt something warm on his head and he turned sharply around. It was Fern, the new girl in the burrow. ‘It will be ok,’ she said sweetly and he noticed she had the longest eye lashes he had ever seen. His tummy went all strange and he forgot the danger they were in. Moments later they had the all clear. It was nothing more than some innocent people walking by. Not all humans were out to get them. So they settled down to a lunch of grass and plants, topped with some of their faeces which gave them extra nourishment (by the way, this process is known as refection). And all the while, Fern and Master Oryctolagus looked into each other’s eyes. The following morning at dawn, the two young rabbits played in the woodlands before school. They ran and jumped in the air, twisting their bodies and flicking their feet. They were very happy bunnies indeed!